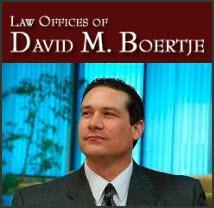 David Boertje received his Bachelor of Arts degree in Psychology from the California State University, Fresno. He earned his Juris Doctor degree at the University of San Diego School of Law where he specialized in trial advocacy, juvenile law, and litigation. David received the State Bar of California Wiley W. Manuel Award for Pro Bono Legal Services in 2001 for his time volunteered to representing abused and neglected San Diego children in the dependency courts. He also served as President of the Criminal Law Society during law school. Prior to forming the Law Offices of David M. Boertje, David received valuable experience as a legal intern with the San Diego County Public Defender's Office. He also worked as a law clerk for Cozen O'Connor, one of the nation's largest law firms. David is admitted to practice in California and is an active member of the California Bar Association, American Bar Association and the San Diego County Bar Association. David is also a member of the San Diego Criminal Defense Bar Association, and Consumer Attorneys of San Diego.